This is one of those recipes that just came together in my head in 3 minutes. 1. I wanted to bake a cake. 2. I didn’t want it to contain eggs, milk or butter. 3. A cake that uses black treacle. You may wonder, what’s the occasion? I have friends visiting me tomorrow. Why no eggs – no milk – no butter? Because during Lent many friends abstain from eating meat and dairy, therefore my guests will have no reason to say no to my cake. The resulting DELICIOUS cake had a dark color, strong flavor and viscous consistency. The combination of treacle and aniseed is the secret to this succulent cake. There’s something flavorful about this blend that lights up my mood even on bad days. For some the taste of treacle, might be very strong and for those who love this taste, close to licorice if I may say, will fall in love with this recipe. You can always use milk instead of water or if desired, use half milk and half water. You may also substitute the black treacle with date molasses. And if you decide to use all-purpose-flour then I suggest you add 2 teaspoons of baking flower. Many options can be explored but my one-advise is not to skip the aniseed addition! Preheat oven to 180°C. In a bowl, mix flour and aniseed. Add oil and stir to make a paste. In a separate bowl, combine treacle and water. Add gradually to the flour paste and mix. Grease a cake mold and pour batter. Make sure it’s flat and even. Sprinkle with almonds. Bake for approximately 40-45 minutes, or until top is springy to the touch and a wooden skewer inserted comes out clean. Allow to cool for 15 minutes in the pan before transferring to a plate. 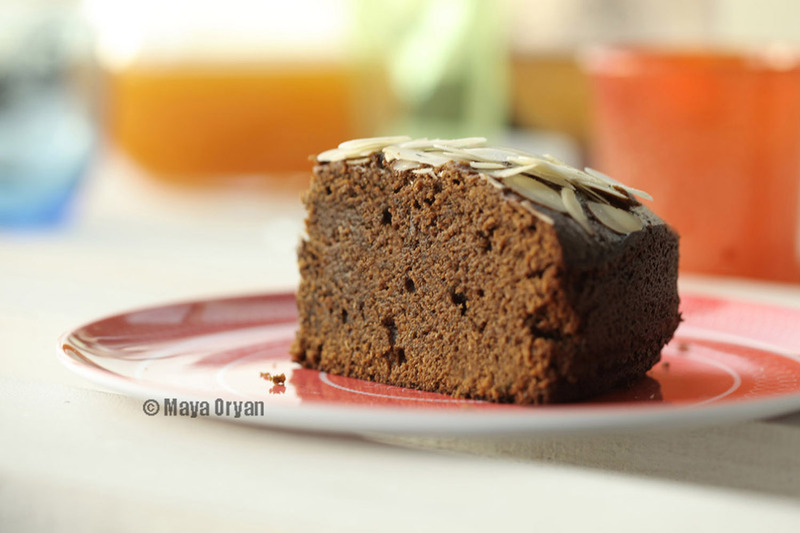 This entry was posted in Desserts and tagged Aniseed, black treacle, Cake, Celebrations, dessert, food photography, Food stylist Dubai, food stylist lebanon, Jamaican, Lent, MayaOryan, no butter, no egg no milk by Maya Oryan. Bookmark the permalink. You bought me with aniseed! I just love it in cakes and cookies. The cake looks amazing. I would never guess it doesn’t contain eggs. I love cake like this. Particularly when smothered in too much butter. Delicious. Sounds lovely! I hope that your friends enjoyed it? They asked for the recipe sp i guess they did!